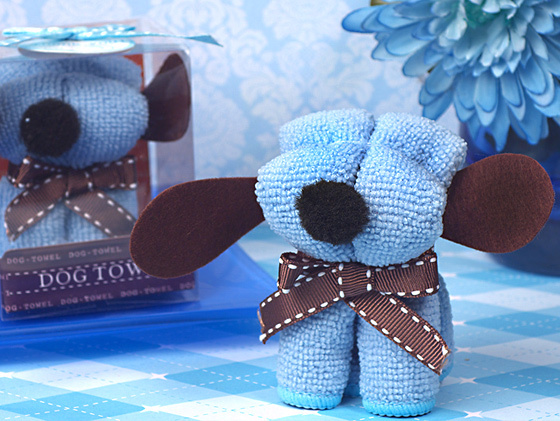 Our adorable blue Puppy dog towel favors are so cute and clever your guests will love this favor treat. Each Puppy dog shaped towel is made of 100% cotton blue hand towel that is cleverly shaped in a figure of an adorable little puppy dog with a brown ribbon bow as a collar. Each cotton hand towel measures approximately 8" x 8" and comes in a PVC gift box finished with a blue satin bow and thank you tag. Your guests are sure to appreciate these useful and practical favor treats.